Using your vehicle for business purposes? Veryfi now has a new app that will automatically record the distance of your trips so you can make the proper deductions come tax time. In fact, you could save an average of $8,800 per year using Veryfi. Veryfi’s new Logbook Mileage Tracker is the safe, accurate, and simple solution to create business travel logs that follow IRS mileage standards in the U.S. and ATO requirements in Australia. It’s especially useful for small-business owners, self-employed entrepreneurs, and gig economy workers like Uber drivers. It’s time to simplify with Veryfi. Running your own business or being an entrepreneur sometimes means you’re piecing together tons of different software to keep track of your expenses, mileage, revenue, etc. It doesn’t have to be this way. Logbook is just one of many solutions provided by Veryfi. We’ve put everything under one roof for peace of mind and ease of use. Expense and income manager with the ability to connect your bank transactions, reconcile transactions, merge AirBnB ledger for landlords, and tax reporting. Mixing their business miles with personal miles. When you’re keeping a paper log of your distance covered, it’s easy to mix up your personal travel with business travel. And when it comes time for taxes, this could result in rejected deduction claims or even penalties. Let’s avoid this and instead use tools like Veryfi, which help you stay on top of your business transactions with minimal intervention. It’s all thanks to machine learning and automation. We call it Veryfi Automatic Drive Detection (VADD). Logbook Mileage Tracker uses our specially developed algorithms to automatically detect when you’re driving. That means no manually starting and stopping a tracker — just let the app run in the background and do the work for you! All of your miles (or kilometers) for business purposes will be recorded, eliminating the need for paper logs and taking a lot of stress off your shoulders. The first few times you use Logbook, the app will prompt you to classify your trips at the end of the day. However, it won’t take long for Veryfi to LEARN your driving patterns and help you more efficiently categorize trips. Give your tax-deductible mileage (or kilometer) records the accurate details they need to pass IRS (or ATO) scrutiny. 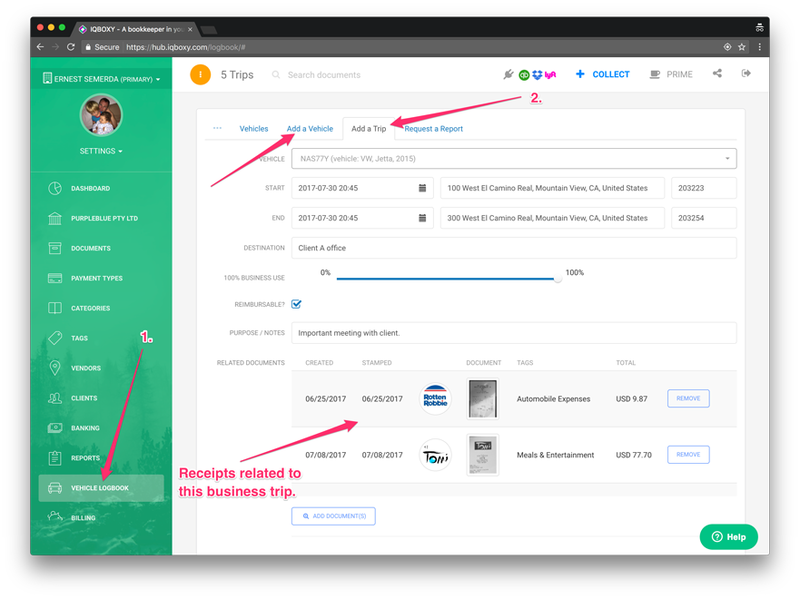 Whether you’re tracking miles or kilometers for reimbursement or tax deductions, Logbook gives you detailed reports of your trips. At Veryfi, your privacy and security are of the utmost importance. Veryfi is the only solution that’s HIPAA compliant. That is especially valuable for medical or health-tech companies, and anyone who wants to keep their data safe. Stored securely in the Veryfi HIPAA- compliant cloud, Veryfi sends weekly mileage/kilometer reports directly to your inbox. Veryfi Web App brings all the amazing functionality found in the mobile experience to the web but with a bigger screen size. If you haven’t explored yet then this is a good time. Head over to https://hub.veryfi.com/ and login with the same credentials as you would on your mobile. Then from the left hand menu press “Logbook” option. You will see something like the screenshot below. It’s that simple.